Based upon my own personal experiences, I know that getting that Fibromyalgia and/or Chronic Fatigue Syndrome diagnosis is difficult. Saying that you hurt all over for no particular reason, that you just can’t seem to get out of bed each morning, that you could sleep for days and still be tired, or that you feel like you are thinking through several layers of cotton just tends to confuse most doctors. Even though there is nothing new about these conditions and there are a growing number of individuals suffering from them, few doctors know much about Fibromyalgia, Chronic Fatigue Syndrome, or Myofascial Pain. Diagnosis, even if your doctor believes you, can take months or even years. Then, once diagnosed, there is no set treatment options leaving us with the primary responsibility of finding options that ease our suffering. 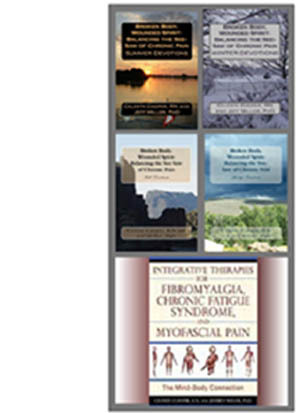 Integrative Therapies for Fibromyalgia, Chronic Fatigue Syndrome, and Myofascial Pain is the book that I wish I could have been given when I started this journey. 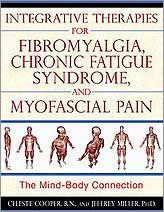 I highly recommend it to anyone who thinks they might have Fibromyalgia, Chronic Fatigue Syndrome, or Myofascial Pain. This multifunctional book will educate you while reminding you that you are not alone. Integrative Therapies for Fibromyalgia, Chronic Fatigue Syndrome, and Myofascial Pain begins by explaining the similarities and differences between the three conditions. Many doctors and most of the literature tend to lump these together because the symptoms are very similar. Nonetheless, the root cause may not necessarily be the same which definitely suggests different treatment strategies. Next, the book tells us how to talk to our doctor. How to explain our symptoms: their location, the intensity and the duration, knowing our rights and when to find another doctor. This is important as after repeated testing and specialist visits, we all start to wonder if the pain is in our head. However, it is at this point that we need to stand up for ourselves and find appropriate healthcare specialists. The final sections are for after the diagnosis. 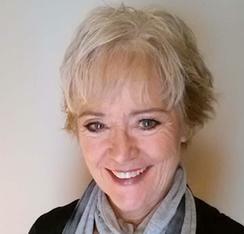 Things like finding support, educating yourself, and figuring out what treatment options might be useful to you. There are also some invaluable tips on living, getting through your day, reworking relationships, and understanding the emotional aspects of these conditions. More about the book can be found here. Inner Traditions, Bear and Company, (Publisher, imprint Healing Arts Press) here. Amazon India (free shipping), here. Australian Amazon Associate (note: you will need to type in the book title), here. For many diseases in our world, we are finally learning the treatments using only allopathic or only homeopathic remedies are seldom the best approach in and of themselves. Much of the confusion has come from the polarized arguments of both sides attempting to defend their points of view, but like most truths the answers are often found in the middle ground, hence “integrative medicine.” I found this book, at 448 pages, to be very comprehensive and I highly recommend it for anyone searching for a balanced approach for the treatment of these diseases.